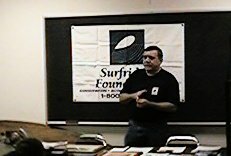 Need a guest speaker for your surf club, school, surfing organization, Surfrider chapter or other activity? Need help with that school research paper? 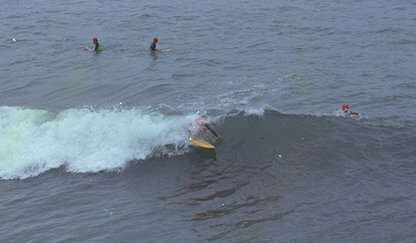 How about contacting a California legend, the original 1960s Huntington Beach Snake? Dr. Bruce Gabrielson, widely published author and surf historian, early day professional surfer, contest judge, surf coach, shaper, board manufacturer, surf shop owner, founder of organized US high school surfing, and Chairman of the National Surf Schools and Instructors Association has been making surf related appearances, giving talks, and helping on research projects since the late 1960s. 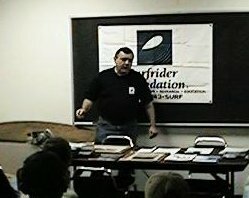 A member of the Capital Chapter of the Surfrider Foundation, he provides both a first hand foundation for the evolution of the surfboard and also his unique perspective on what organizations like Surfrider have done and continue to do for the world of surfing. Dr. Gabrielson will be happy to make a presentation to your school, club, or other organization. Presentations usually last from 1 to 1 1/2 hours and include pictures, boards, historic templates, equipment, short surfing clips and sometimes a demonstration with his wave pool model. Requesting organizations, if outside the Mid-Atlantic region must pay transportation costs and provide a place for Bruce to stay on overnight trips. No other costs are involved. Dr. Gabrielson can also support your activity or help judge your contest. He often travels or attends events with other widely recognized surfing celiberities. Travel costs and accomodations must be provided. If you need a dedicated outside judge, this is a good way to go and the costs are very little. If the contest is in Delaware, there are no overnight costs involved. However, availability is sometimes limited as he also does a lot of traveling for professional appearences in the scientific and academic communities, plus teaching surf instructor classes. Get in touch with him well ahead of time and he will try to make arrangements. If you are doing a school project or paper, Dr. Gabrielson can help. He provides both guidance and reference materials for numerous papers each year at no costs. However, Since there have been many similar papers over the years, he asks that final papers should be submitted for inclusion in his surf library. In this way, others doing similar projects in the future can benefit from previous work. Requests are simple. email to Bruce and wait for the reply.